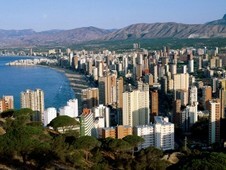 Car rentals in Spain: travel "intelligently"! A holiday spent in the sunny Spain can be compared to a real fairy-tale, which bright moments will forever remain in the memory of any tourist. Spain is the best European highland, ready to demonstrate its cordiality and hospitality to all its visitors, make them aware of its unique architecture, and present unforgettable impressions. Starting your travel to this country, you will surely desire to «embrace the boundless», to see as many attractions and memorable places as possible, and more than that, to do so for that short period of time, which you will spend at this magic land. Having hired a car in Spain though the bookingcar.ru service, it is quite possible to obtain a perfect possibility to get closely acquainted with this beautiful country. While only a car travelling can allow you to ignore distances and enjoy every minute of your holiday with a special comfort. The parking slot fee is influence by the time of day and the day of week, and even by the week of month. Some places require a special permit for car parking during the working hours, which are called in Spain “Horas laborables”. The cities centers are supplied with a limited number of parking lots. So, in order to leave your car in a blue zone, it will be necessary to purchase a special parking coupon issued by an automated device. During the weekdays, the payment can be performed from 9:00 AM to 2:00 PM and from 4:00 PM to 9:00 PM, and on Saturday the payment is performable only in the first part of the day from 9:00 AM to 2:00 PM. Most of the cities have underground parking stations, showing the presence or absence of available parking lots. Such parking fee is paid before leaving the parking station at the payment zones or at a checkout counter. Some of the Spanish cities use the Ora Zona system at the parking stations. Parking coupons are valid for 30, 60 and 90 minutes, can be purchased in many city sales points or tobacco shop. If you are travelling along Spain by a rent car, remember not to leave your car in the places with a breakdown truck sign. In this case you are at a risk of meeting an unpleasant situation and having your car towed. To have your car back will be possible only after penalty payment in the amount of up to 100 €. Parking in the places intended for people with disabilities can result in a more severe «punishment» - a penalty up to 200 €. If you are planning to lease a car right in the airport, upon your arrival to Spain, then you should refuse from alcoholic drinks prior and during the flight, because the alcohol limit exceeding penalty amounts to 500 €. The limit itself comprises 0.5 per mille for experienced drivers and 0.3 per mille for those, whose driving experience is less than two years. In case of refusal of consent to pass a blood alcohol content test, the penalty will stay unchanged and amount to 500 €. Low beam should be obligatory used only while passing through a tunnel. Children under 3 years can be carried in cars only in special child restraint systems, necessarily corresponding to the weight of a child. Older children with a height below 135 cm should be carried in a child seat or a booster. It is forbidden to talk by a cell phone while driving a car in Spain without using any special technical devices. More than that, your cell phone should be turned off while fueling a car tank at a fuel filling station. In Spain it is possible to purchase 95 or 98 standard lead-free petrol – “Gasoline sin plomo”, or diesel fuel called Gasoleo 'A' or Gas-oil. The leaded petrol is not for sale in this country. The gas filling stations are also available, but in low quantity. The cheapest fuel can be found in the Canary Islands. The cost here is lower for 0.20-0.22 €, than an average price along the country. Rush Hour during the day. Tenerife from 10 eur a day.